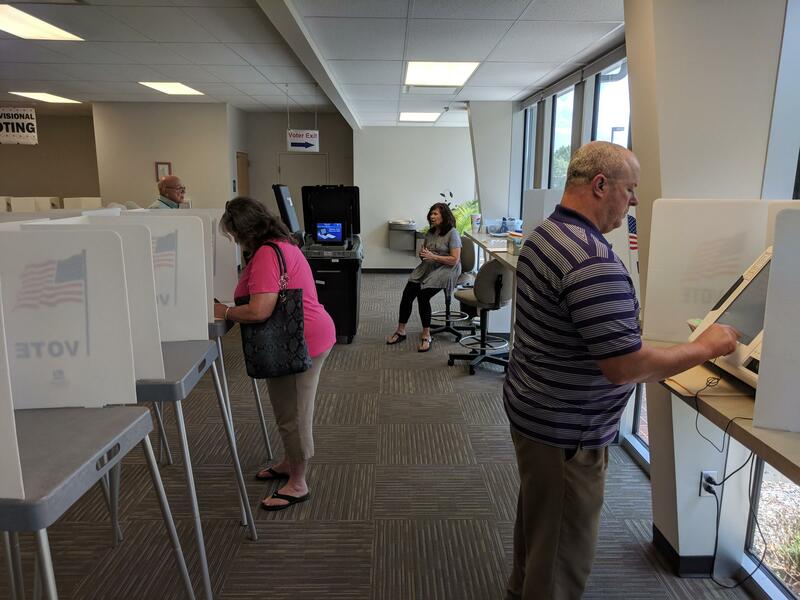 Even as candidates scramble to raise, and spend, campaign dollars, early voting is already underway in the Kansas primary. Several candidates for governor in the first election since Sam Brownback left the office earlier this year find themselves nearing next Tuesday’s primary on a path to burn through nearly all they’ve raised. Republican Secretary of State Kris Kobach led the candidates for governor in money raised from Jan. 1 to July 26 with $1.7 million. Nearly all of it, $1.5 million, came from his running mate, Wichita businessman Wink Hartman. Most of that came as loans. 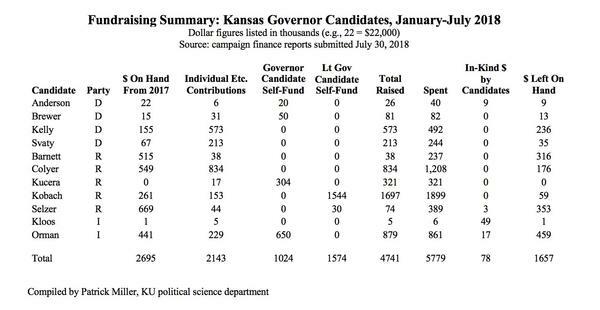 In fact, University of Kansas political scientist Patrick Miller said, about 55 percent of the cash raised by all the contenders in the governor’s race came from the candidates themselves. “Which is extraordinary and bizarre for a governor’s race,” Miller said. Although wealthier candidates historically often fund much of their own campaigns, Miller said it is far more rare for the No. 2 candidate on a ticket to pick up the tab. “I’ve never seen a gubernatorial campaign like that anywhere, ever,” Miller said. The influx of cash has given Kobach the ability to spend more during the period on campaign costs such as advertising. A single ad buy on July 13 rang in at $533,000. Republican former state Sen. Jim Barnett, a physician, previously loaned his campaign more than $500,000. Self-described “entrepreneurial evangelist” Patrick Kucera’s fundraising was almost entirely made up of more than $300,000 from himself. Republican Insurance Commissioner Ken Selzer and former Democratic Wichita Mayor Carl Brewer have also put their own money into their campaigns for governor. Independent candidate Greg Orman dropped more than $650,000 on his race. Incumbent Republican Gov. Jeff Colyer raised the most from donors who aren’t also candidates. His report showed $834,000 during the latest filing period. Colyer made headlines for loans extended at critical points in the 2014 campaign, when he was lieutenant governor and then-Gov. Brownback was running for reelection. There were no candidate loans in Colyer’s latest fundraising totals. “I am humbled that our message of strong, optimistic, competent conservative leadership has resonated so well with Kansans,” Colyer said in a statement. Colyer has also been pouring money into large advertising buys in advance of the primary. On the Democratic side, state Sen. Laura Kelly led in fundraising with $573,000. “I’m honored to have the support of such a broad and diverse group of Kansans,” Kelly said in a statement. Former Kansas Agriculture Secretary Josh Svaty raised $213,000 and Brewer brought in $81,000. The reports suggest several campaigns aren’t stockpiling for a general election. Kobach on the GOP side, along with Brewer and Svaty on the Democratic side, all have used most of their money. Kobach had $59,000 left in his war chest. Svaty maintained $35,000 and Brewer had just $13,000. That compares to Colyer with $175,000 and Kelly with $236,000. “I am a little bit surprised by the number of candidates who have basically spent themselves into being broke,” Miller said. Political action committees have started lining up behind some of the candidates for governor. Colyer has garnered the support of more than two dozen organizations. He received donations of up to $2,000 from groups spanning a wide range of sectors. The donors range from the Kansas Livestock Association, health care and pharmaceutical PACS to the Kansas Beer Wholesalers advocacy group. Selzer got money from two insurance PACs and the Livestock Association. On the Democratic side, Kelly had the support of a dozen PACs, including some that supported Colyer. Kelly also attracted PAC support from unions and transportation workers, as well as the Kansas Livestock Association. The Kansas Livestock Association also donated to Svaty’s campaign. Other groups are also starting to show up in the 2018 campaign, some of which are not constrained by the same spending limits as PACs. One is working on behalf of Orman by criticizing Kelly and Colyer, according to a story by the Wichita Eagle. That could reflect a calculation that the independent’s chances would be better in a three-way race with Kobach and Svaty. Miller expects fundraising, and PAC activity, to pick up following the primary. Money has poured into the Kansas races from across the country. Orman and a former Google executive running for secretary of state both have seen considerable out-of-state donations. For Orman, some of that money came from Minnesota, where he was raised. Democratic secretary of state candidate Brian McClendon pulled in contributions from Silicon Valley. “Certainly, McClendon having lived in California and worked there, has a lot of connections,” Miller said. McClendon raised $509,000, although $150,000 came from himself. McClendon far outraised the best-funded Republican candidate for secretary of state, House Speaker Pro Tem Scott Schwab, who gathered $65,000, including $25,000 of his own money. Democrats have not performed well in statewide races in recent years and have failed to win elections for offices such as attorney general, insurance commissioner or secretary of state.